We Have the Story. From Design to Print. This holiday season, we had the pleasure in working with designer Jennet Liaw and printer Mama's Sauce to create our holiday card. We were determined to send a card that wasn't immediately tossed! What was the directive from Legion and how did you translate that to your design? [Jennet Liaw, designer] The brief was very open-ended, which made it great fun for me to design completely from the direction of spotlighting the paper itself, and to play with printing technique choices - this is something clients are often stingy on. With great suggestions from Nick and Hogan, I knew I wanted to apply a foil, as well as make a die cut, so I kept the stroke weight simple and illustrative to balance out those techniques into the clean aesthetic that I personally like.. made extra special for the holidays with sparkle and shine. Did you revolve your design around the paper or the other way around? If so, how did the paper inspire the design? / The base paper is Sirio Ultrablack – by all accounts the blackest paper we’ve ever seen – how did that affect the design? [JL] It seemed counterintuitive at first to use the blackest black to create a card for the holidays, a time usually associated with festive reds and greens, or warmth and earthiness. 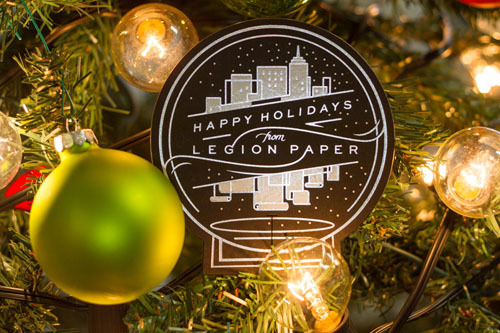 But it was an opportunity to create a high contrast effect, perfect to show off just how incredibly black Legion's paper was, and how beautifully bright the white/foil that Mama's printing would create. I enjoyed that the final product was a gently alternative take on the holidays - crisp like the wintry air and festive in a clean way. What print methods did you use and what worked well with the paper? Were there any particular challenges? [Hogan Birney, printer] We ended up choosing Hot Foil Stamping for the entire piece as it is the best way to letterpress light colors on dark papers. The metallic foils work great as they cover very nicely and provide that shine that foil stamping is known for. A shine that works really well with the holiday theme and we knew would tie in with the Mirri Sparkle Paper. White foil is a bit tricky on dark papers and larger coverage areas, but since this piece was run 1 at a time, we had some flexibility and were able to get the white foil looking great. We know you were a little hesitant in using the Mirri Sparkle. Having worked with it – what are your feelings now, both in terms of design and in terms of working with it in production? Would you use it/recommend it again? [JL] It's an incredible paper. I had shoved the folder of samples in my suitcase to review while traveling, and when I casually drew out the Sparkle at the airport, it turned literally heads. After working with it, I know that a dominant paper like that can't be a second thought or late decision - it's definitely the star. I'm a believer in going full force, all the way, with any design decision - if sparkle is the goal, Mirri Sparkle is an awesome choice. What finishing did you use and what worked well with the paper? 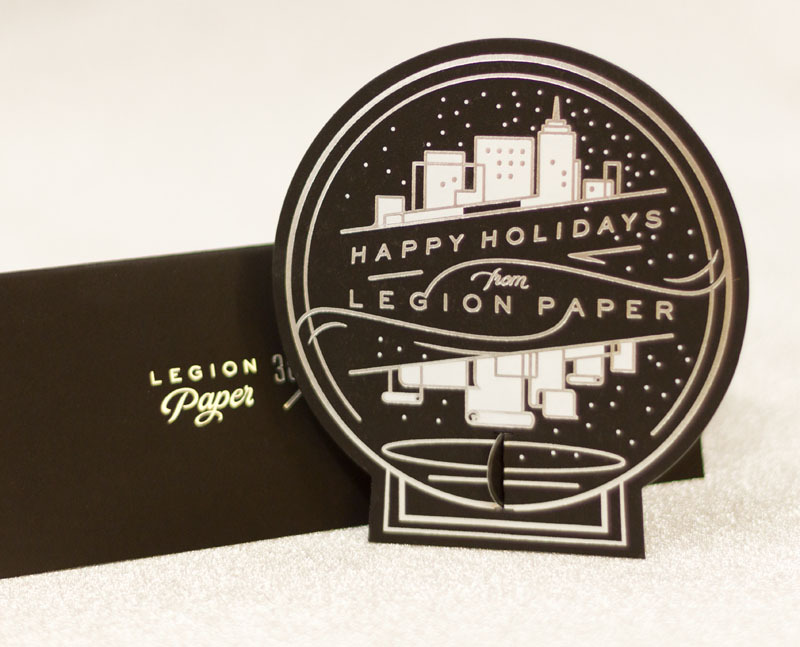 [HB] The cards were trimmed using a custom cutting die, created to mimic the shape of a snow globe. The card size and design direction that Jennet took allowed us to use the exterior portions for a border that would incorporate punch-out directions and a stand for creating a sort of 3 dimensional snow globe. The Sirio Black mounted to the Mirri Sparkle die cut extremely well due to its dense nature and slightly coated surface on the sparkle side. Being that it was a thicker paper, the die cut created a nice bevel on the face side of the card. Designing for a paper company – where the goal is to highlight the paper as well as the company – does that change your process at all? Anything else you think is important to include that the design community might want to know? [HB] I think that it is important to note what can really be done with a simple piece. This is only a 2/0 (2 color on one side only print) that has a very dynamic and interesting look. By using different paper colors mounted together and making great use of the space from a design standpoint, it opens up room for the materials and process to really shine. Its very easy to get caught up in trying to get 4 colors on one side and 2 on the other that are printed, but by keeping things simple, not only does it help with production consistency with processes like ours, but it also helps with your production costs without sacrificing a unique look. We were excited to see the new Sirio Ultra Black this year in our 5th annual National Stationery Show scavenger hunt and even more thrilled to hear the reviews from designer Brad Woods at Maginating and printer Ronnie Williams from DeFrance Printing. This intense shade of black performed incredibly to create a clean and rich piece. Why did you choose this paper? We chose it because Marc recommended it. For the past couple of NSS/Legion promo pieces, I've contacted Marc, asked him what paper he would recommend, and go with his recommendation. Simple as that! Is this your first time working with the paper? How did the Sirio effect your design? Design wise, it was a blank slate until I knew which paper stock we'd be using. Once we knew it was going to be this ultra-rich 680 GSM Sirio, I felt it would be striking it we kept the design fairly simple: let the contrast between the paper and two colors of foil tell the whole story. When you're dealing with a colored paper as rich as the Sirio, you know that a large part of the design is the paper itself. And if you know what it's like to work with black stock, the simplicity tells a pretty compelling story. We'd worked with other thick, black stock in the past and it had been a bit of a mess. In fact, with the other paper, we'd had to slip-sheet each piece just to keep things clean. Over time, the paper began to show through both colors of foil! This is not the case with the Sirio. It's very clean and very dark. Initially we wondered if we'd encounter a problem with the white foil, particularly since the edges of the lettering would have nowhere to hide. But it wasn't a problem. Ever. That may partially be due to the fact that we work with one of the best letterpress printers in the country, DeFrance Printing. But Ronnie Williams, General Manager (and master letterpress printer) told me there were simply no issues with either the white or bronze foil - and there's a pretty decent amount of coverage with the bronze foil. It was a low-maintenance paper that was extremely flexible with the foil's adhesive. They didn't have to use any special foil, it was a standard off-the-shelf stock. Would you recommend Sirio to other printers/designers? Absolutely - you will not be disappointed!